Warrington Town chairman Toby Macormac says their FA Cup run has achieved the double bonus of a £200,000 windfall and attracting local rugby league fans. The Northern Premier Division One side beat League Two Exeter City to reach the second round for the first time. Their reward was a trip to Conference club Gateshead on Sunday. "If you take into account the Gateshead game and look at the numbers, you're not going to be far off £200,000," Macormac told BBC Radio Merseyside. Warrington are managed by Shaun Reid, brother of former England international Peter, and his group of part-time players made light of the 100-place gap between themselves and Exeter in round one. With a squad including a catalogue model and a solicitor, funds are usually quite tight. But the prize money and television revenue generated from the best cup run in their 64-year history has set the Yellows up for the future. "It's an astounding figure and something that will definitely help sustain the club for seasons to come. We've got a great board of directors and we'll use those finances to take the club forward," said Macormac. The town is more renowned for rugby league, with Warrington Wolves regularly challenging for domestic honours, but many of their supporters have been caught up in the cup fervour. "There are a lot of rugby league fans that have come down and watched us," said Macormac. "To get both the sports in the town integrating from a fan perspective is great to see." 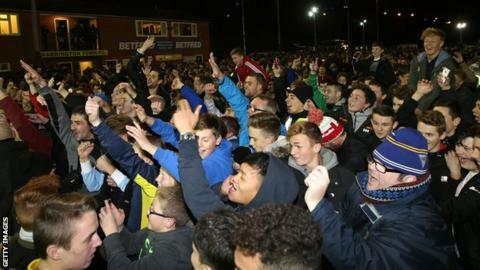 Warrington's Cantilever Park ground sold out within three hours of the 2,500 tickets going on sale for the 1-0 win against against Exeter. "We're under no illusions that when the Super League season starts, some of those fans will drop off," added Macormac. "But when the Wolves are away, will they come and watch us at home? It's great to see that link between the two sets of supporters."